Maybe this is interesting...barchart.com on Cytori. All and everything.. short term, medium term and long term outlook- all green. I took a look at the Frankfurt Stock Echange with Cytori. 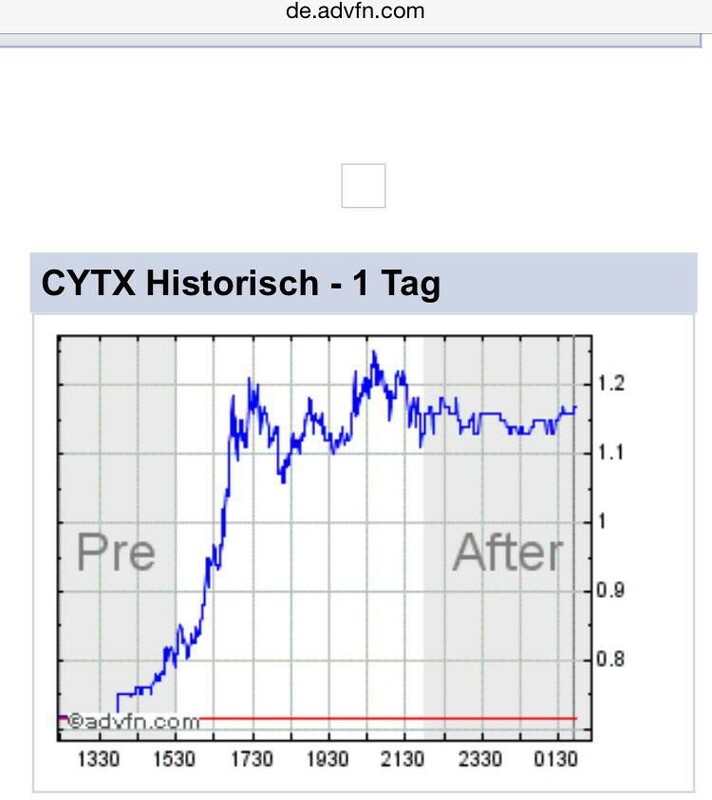 CYTX is up 12% this morning. Do you have any experience in comparing the German CYTX stock activity with the US one? Euro about 13% higher than the dollar last I looked. Most after-hours trading on Nasdaq is noise... someone with a couple hundred dollars buying or selling on a huge spread, or trades that were actually made in normal trading showing up after-hours. From belgiumineurope's link, I see 39,300 shares traded over 2 hours. Compare this to typical volume of 300K-500K in the first hour on Nasdaq and several million traded yesterday in the first hour. What's the bid-ask spread on the Frankfurt exchange for CYTX? Yes- the German exchange is peanuts now. But I am sure a few Mio shares are still in Germany. I own most CYTX through IB, but also some XMPA thru a German broker account. Forgot to explain a bit- since I was in a hurry for my acupuncture visit this morning. As you might know MacroPore later Cytori was only listed in Germany until December 2005. When they went on Nasdaq than, they abolished the primary listing on Xetra (which is the computerized exchange similar to nasdaq) within a year. But they kept secondary listings on the "presence exchange" Frankfurt and the regional stock markets of which Stuttgart is the main one for Cytori. That one is linked up with Nasdaq by computer and filled bids there are normally the "counter part" of a pre-market trade on Nasdaq. Thats why I like German traders picking this up too- they take care of a lot of pre-market volume.